New York City launched Vision Zero in 2014, and since then the campaign has pushed for transportation improvements to promote safety and lower the likelihood of traffic fatalities. 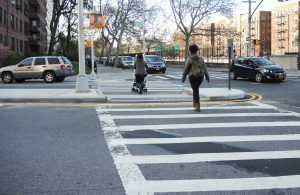 Many of NYC’s Vision Zero improvements have taken place near schools to protect children, a particularly vulnerable population. Thanks to Vision Zero’s efforts, by 2015 there were 140 speed cameras throughout the city near schools. These speed cameras generated over one million tickets in 2015, but after two months of operations, driver violations and speeds declined significantly and have been down ever since. Permanent street safety improvement projects near schools have also taken place. School Slow Zones were installed to reduce the speed limits on roads adjacent to school property to 15 or 20 mph. Road diets, pedestrian islands, curb extensions, and bike lanes have been implemented, and marking, signals, and signage have been installed. These projects have both reduced the incidence of crashes and made walking and biking to school more comfortable and safe. 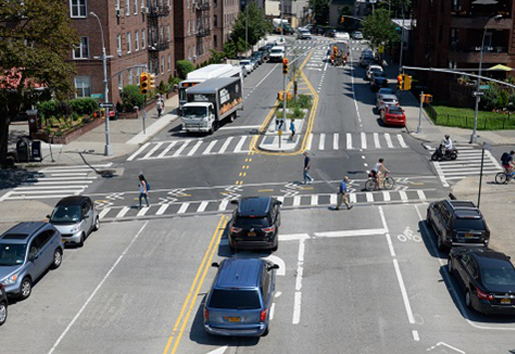 One neighborhood in Brooklyn is a great example of how traffic-calming measures can come together and exponentially improve a community suffering from dangerous driver behaviors. The story below details how a new school, and its accompanying safety improvements, changed the neighborhood for the better. Caton Avenue before and after construction. Kensington, Brooklyn witnessed enormous infrastructure changes throughout the community in 2015. After a student was killed in a hit and run in November 2014 on Caton Avenue, one of the community’s most heavily-trafficked streets, the planned completion of a new school pushed the DOT to install a road diet on three blocks of the corridor to accommodate an increase in student traffic. Prior to the opening of MS 839, Caton Avenue and surrounding roads were upgraded to slow down vehicular speeds and prioritize pedestrian safety. Concerns about traffic safety in Kensington were identified between 2014 and 2015 through a variety of community meetings and presentations. Pedestrian-vehicle conflicts, a lack of pedestrian crossings, long crossing distances and high vehicle speeds were all recognized as existing issues. There were also concerns expressed about the increased traffic MS 839 would generate on the neighborhood’s narrow, local streets. 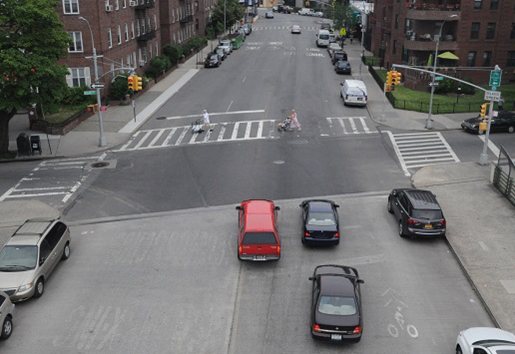 These issues, and their appropriate solutions, were all addressed in NYC DOT’s redesign plan. The preliminary impact, measured through one year of data after the projects were completed, points to some incredible safety improvements for the neighborhood and those traveling through it. Total crashes were reduced by 13%, pedestrian injuries were reduced by 40%, and overall injuries were reduced by 53%. Caton Avenue in particular is more pleasant to travel on, especially for bicyclists and pedestrians who can feel more confident traveling and crossing thanks to stricter boundaries for automobiles. While the hit and run in 2014 is likely what pushed NYC DOT to start thinking about safety on Caton Avenue, the nearing completion of MS 839 encouraged swift and immediate action. Vehicles traveling at slower speeds, whether by design or law, are much less likely to seriously injure someone in the event of an crash. Hopefully, the new and improved Caton Avenue will prevent a tragedy from happening again.